My BIG-Little find at the Iowa State Fair was this awesome Tupperware bowl I’ve had my eye on for a while. This houses up to 42 cups of my mixed flours for the gluten-free bread I make! Make in bulk and ready to go! You know how something little can make or break your day? Someone says the right… or wrong thing. Someone gives you the right… or wrong look. Someone shows up… or doesn’t. It’s crazy how some days the “tone” of our entire day can be either enhanced or destroyed in a matter of minutes, glances, or few words. Which day would you choose? IF you could indeed, choose the day? I don’t really need to ask – do I? Let’s consider how we view our day, in light of how God views us. With constant grace, mercy, and love! I’m making an effort to go to bed earlier, to drink more water, and to count my blessings TWICE each day. After all, everyone hears enough about the negative everywhere else in our world. All of these things contribute to me being Healthy for Him each day. Try shining His light wherever you go today! 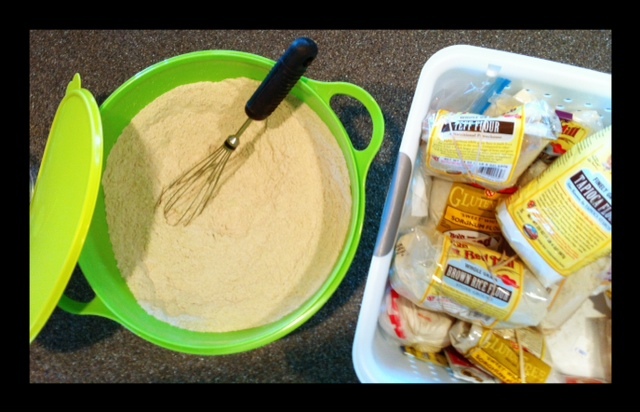 Posted on August 20, 2012, in Celiac/Gluten Sensitivity, Our Struggles, Truth and tagged celiac disease, gluten free bread, Gluten-free food, healthy for him, Mix Flours, Tupperware bowl. Bookmark the permalink. Leave a comment.